I am in a warehouse in an undisclosed location in Hackney, East London. 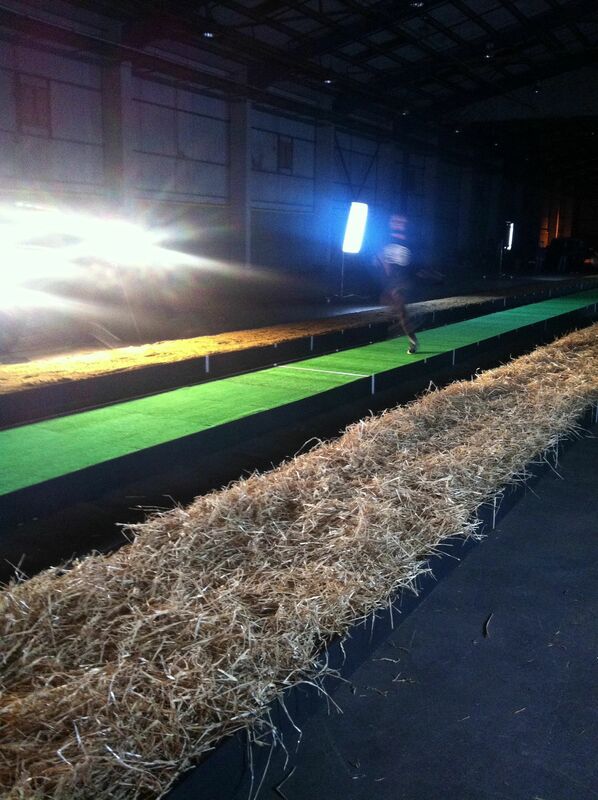 I am crouched at the edge of a single-lane running track whose surface is covered in AstroTurf. To my left is a second track covered in hay. To my right a third track, this time in dirt. Less than two meters in front of me is crouched the Team GB Olympic sprinter Harry Aikines-Aryeetey. The sound of a wood block being struck echoes through the air as Harry explodes out of the blocks and flies away from me, legs pumping and arms driving in an indescribably graceful unity of form. This is surely what Spalding Grey meant when he spoke about perfect moments. This is not the sort of experience you can buy. Nor is this the sort of experience you can fully appreciate by reading about it. Not even video shot from my point of view would come close to the actual experience. The way the footsteps echo through the cavernous space, yet the grunt of exertion as Harry launched himself into motion seems to hang in the air. The crisp, cold, autumnal feel of the air. The sound of gently cushioned feet slamming into the various track surfaces. My senses are alive in an almost magical way. I feel this moment. The story of how I came to this time and place is all about running, as so much of my life is these days. If you've seen pictures or video of the event you understand on a visceral level why so many of those present are there. Harry is magic on the track. Shameek is the next generation, he is hope, and grace, and an infectious winning smile. Charlie is our Yoda. Our zen master. Our surrogate father. The man who changes lives while saving himself. He is the inspiration and soul of Run Dem Crew. The others are, for the most part, a glorious collection of youth, energy, creativity, and hope. But who's the balding guy with the stringy long hair and the goofy grin? How do I fit in? There are a lot of answers to this, but for tonight the best one is that he is a guy who has run the streets of London, New York, Berlin, Amsterdam, Paris and more; he's run the hills of Croatia, and the mountains of the French Alps; not to mention the beaches of LA and Turkey; and he's done it all with barely 3mm of rubber between the soles of his feet and whatever surface he is covering. When he talks to you about how a run felt it isn't just about his legs, his arms, his lungs. He will also talk about the rich tapestry of surfaces. The awareness of every rock, the roughness of the bark on a tree root, the feel of a mountain stream. For him running is many things, but tonight he is here because running is always about the feel of what lies under his feet. Because tonight is a special night put together by Nike to introduce a broader audience to this very tactile aspect of running. 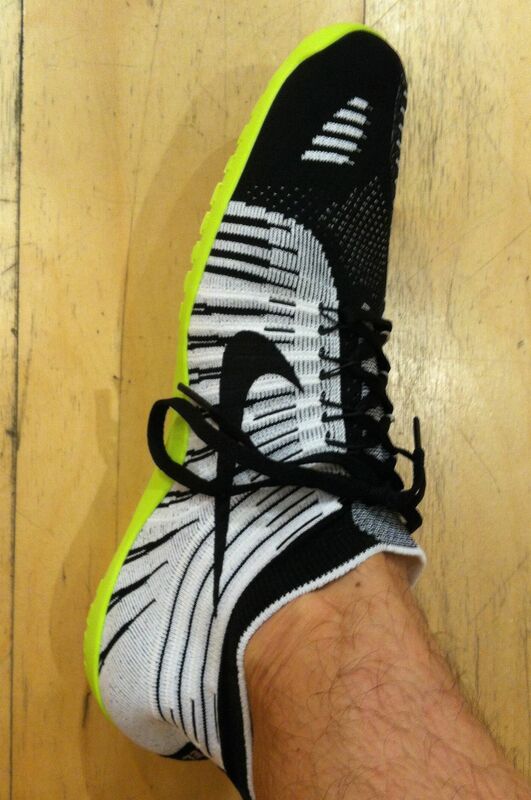 And, being Nike, this is something they are doing by introducing their most minimal shoe yet, the Nike Free Hyperfeel. And I, who am not known for buying into the frenzy of the latest shoe, am actually quite excited. I know that the way I run is not for everyone. There is an austerity and a commitment which I thrive on. I have long hoped that my understanding of why Nike doesn't make shoes like those I favour was mirrored by Nike understanding that while I was happy to sport their kit from head to knees, they couldn't have my feet, at least not while I was running. And I must confess I have had my pangs of jealousy when I have seen some of the beautiful pieces of engineering and design Nike has put on the shoes of others in my crew. But tonight is the night that I get to help introduce the world to my way of running, with a little more comfort. Yes, Nike, these are shoes I can run in. And I really hope that a lot more people are going to start experiencing the magic of really feeling what is under their feet. Appreciating the many different textures of concrete in their cities. Gaining a new understanding of cobblestones. Sensing a different aspect of nature on the trails. And beaches. Learning a whole new level of what running feels like. This page contains a single entry by Daniel Maskit published on October 23, 2013 5:42 PM. Blazing Through Berlin was the previous entry in this blog. In which I run the Nike Women's Marathon and am welcomed as an honorary member of Gyal Dem Crew is the next entry in this blog.